Winter Solstice Festival is a few days away and will fall on 22nd December 2013. 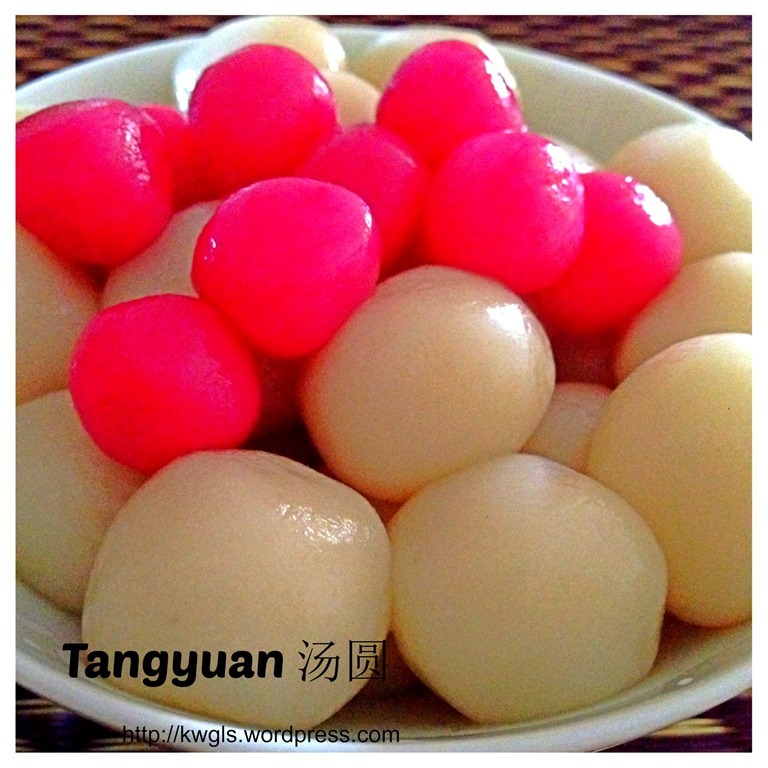 On the day, most Chinese will have the habit of eating Tangyuan or glutinous rice flour balls. In my clan, it basically mean that winter had arrive, time to get ready for the arrival of a new year in the next spring. Of course, Tangyuan were also served in a number of occasions and festivals such as wedding ceremony and 15th day of the first month of Chinese New Year. Very frankly, I do not know exactly what to write for this post. 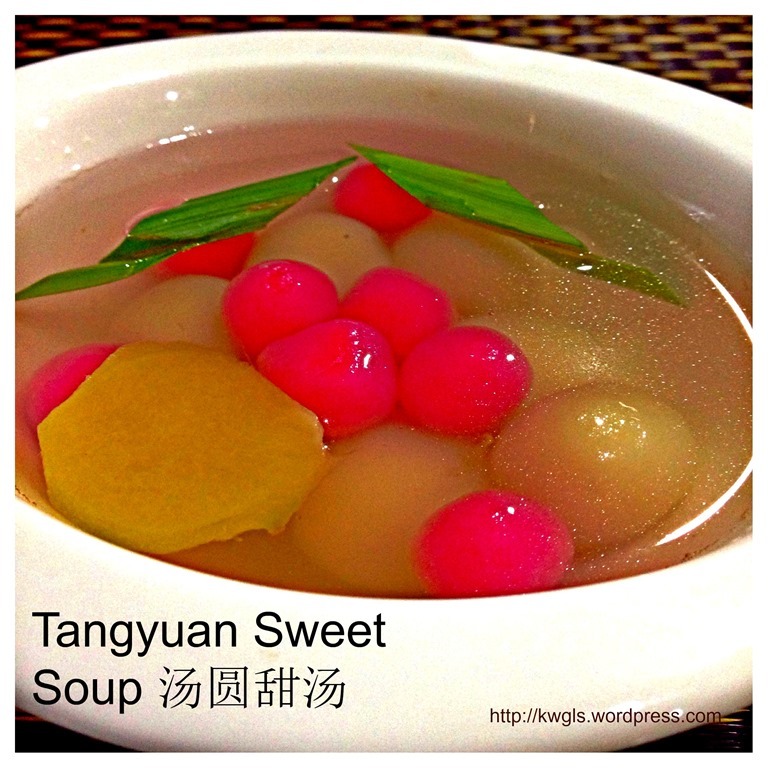 It is not actually a recipe as most households will know how to prepare Tangyuan. 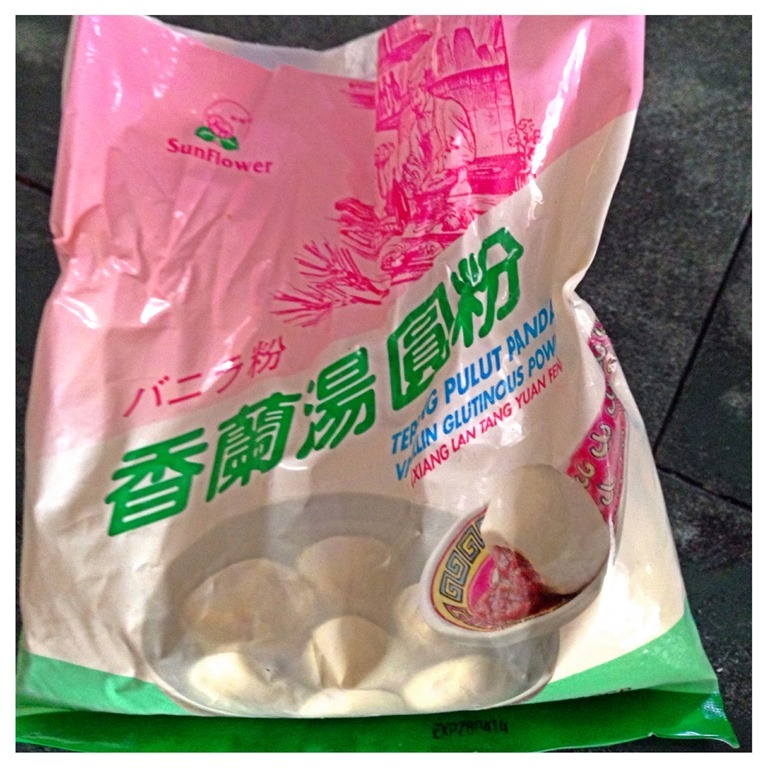 In addition, there are more and more Tangyuan sold over the counter with all types of fillings. 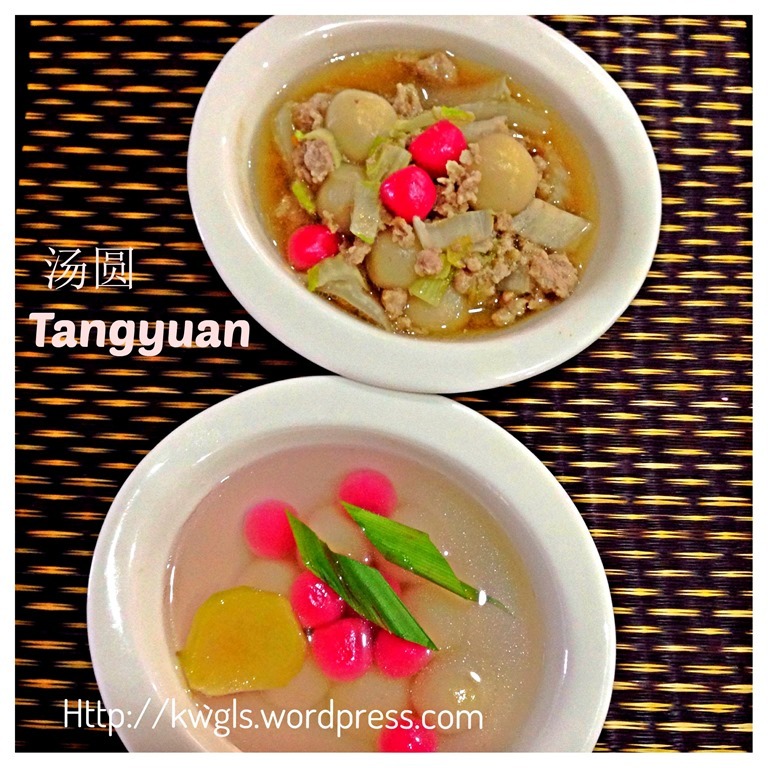 I have decided to prepare these Tangyuan as a respect to the Chinese Traditions and as a blogger, I must at least have a post on this special Chinese cuisine. 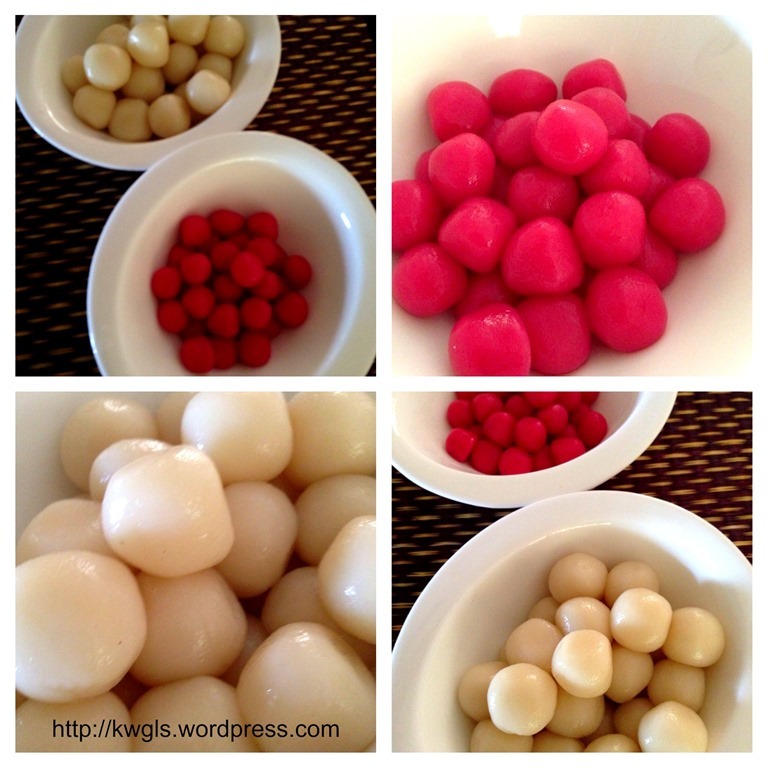 I have resorted to the preparation of the most basic traditional Tangyuan that my mum used to prepare. Basic in the sense that there is no filling and prepare for the purposes of praying ceremony. When I was young, my mother will grind the glutinous rice grains and prepared these simple Tangyuan early in the day of the Festival for praying to the Gods in the temples. There were usually only two colours, white and red. 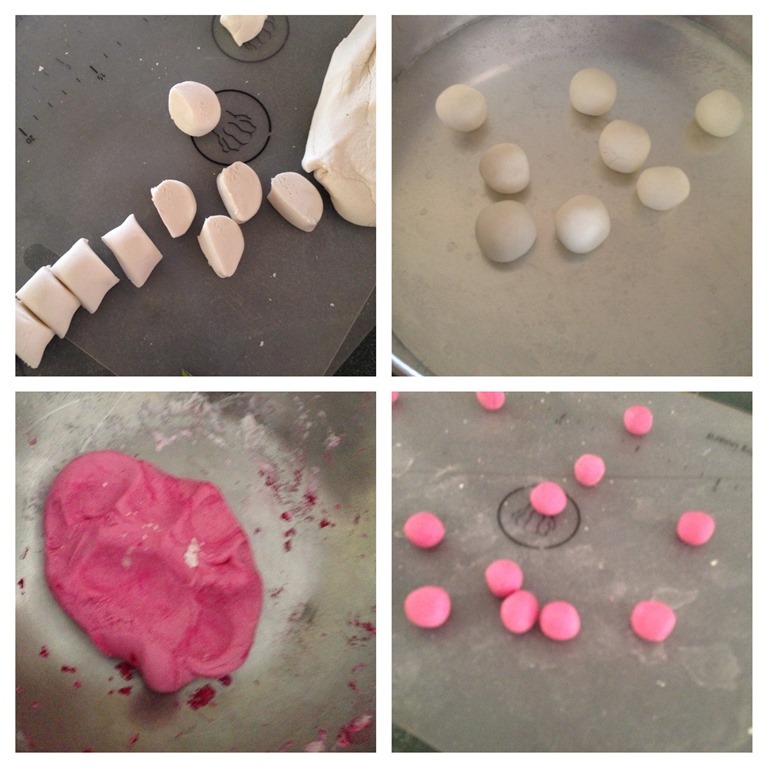 80% were prepared in white bigger balls whereas the remaining 20% were prepare in red smaller balls. 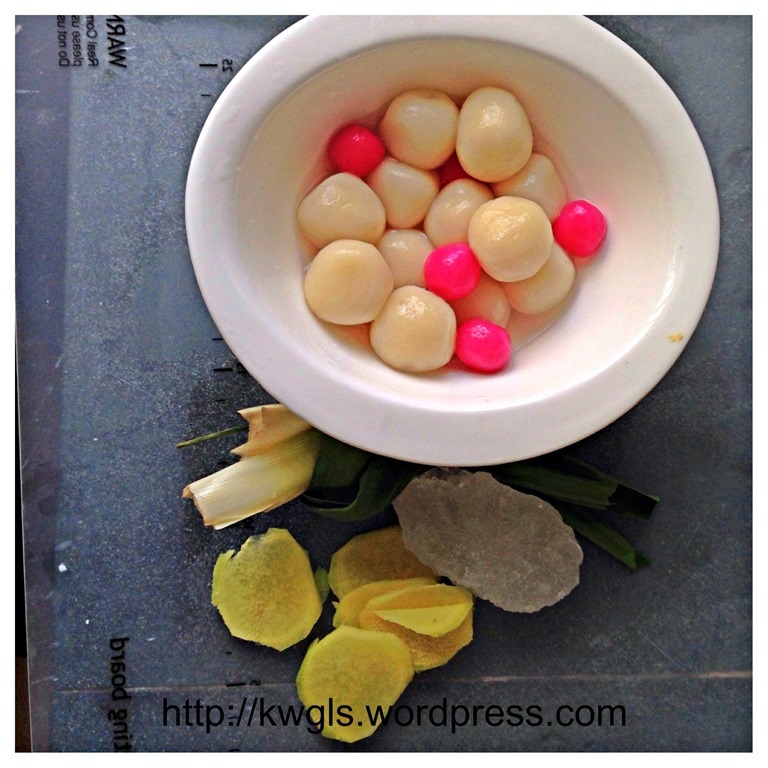 During praying, the bowl was full of white Tangyuan and topped with a few red smaller Tangyuan. In a big bowl, place the glutinous flour and tapioca starch. . Add 3 tablespoons of boiling hot water, use a spoon to gradually mix until it form some crumble. Gradually add in the lukewarm water and use your hand to knead until smooth. Remember, if it is too dry, add one teaspoon of additional water and if too wet, add one tablespoon of glutinous rice flour until the dough is consistent, soft and will not stick to your hand. 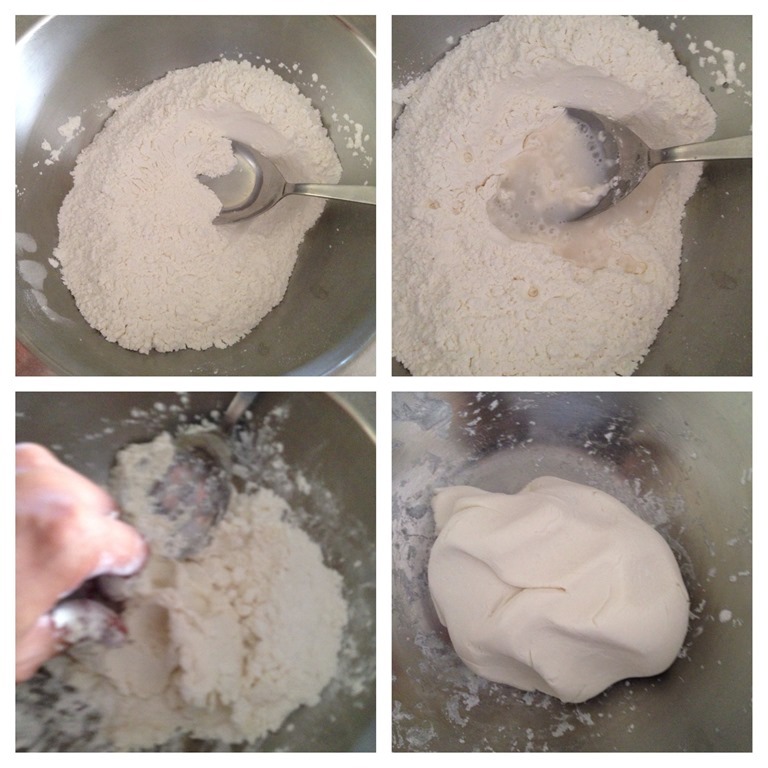 Divide the dough into 2 portion. Put some red permitted food colouring in one portion and knead it until even. For each portion, roll your dough into a long shape and use a knife to cut as evenly as possible at your desired size. Roll into a ball using your palm. For my case, my white balls were approximately 1.5 cm in diameter and my red ball is about 7cm in diameter. In a big pot, bring some water to boil under high heat. 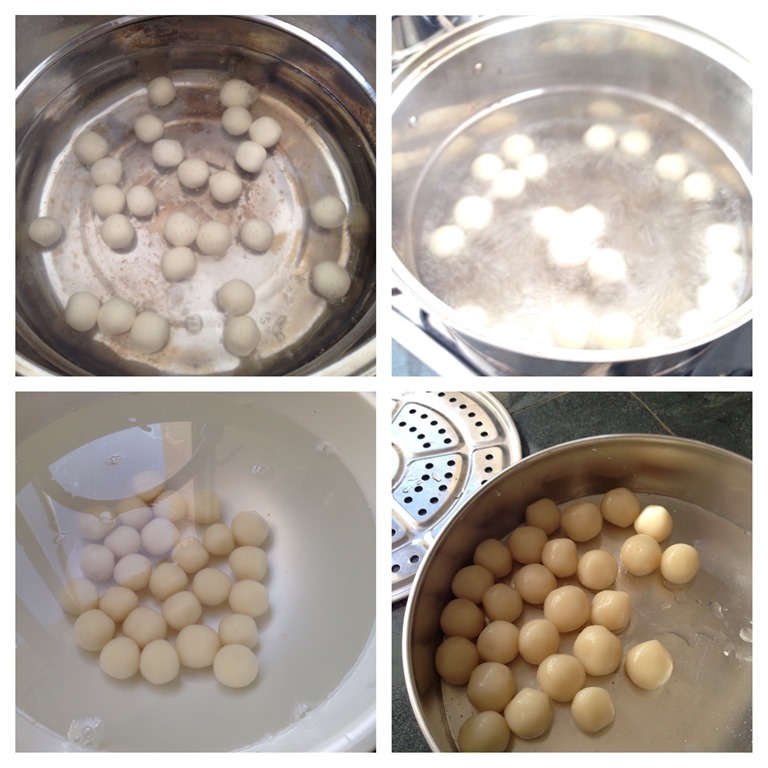 Place your glutinous rice balls in the hot boiling water. Continue boiling until the balls floated in the water. Drain the balls and put it in some cold water. Drain and put in a dry bowl.
. 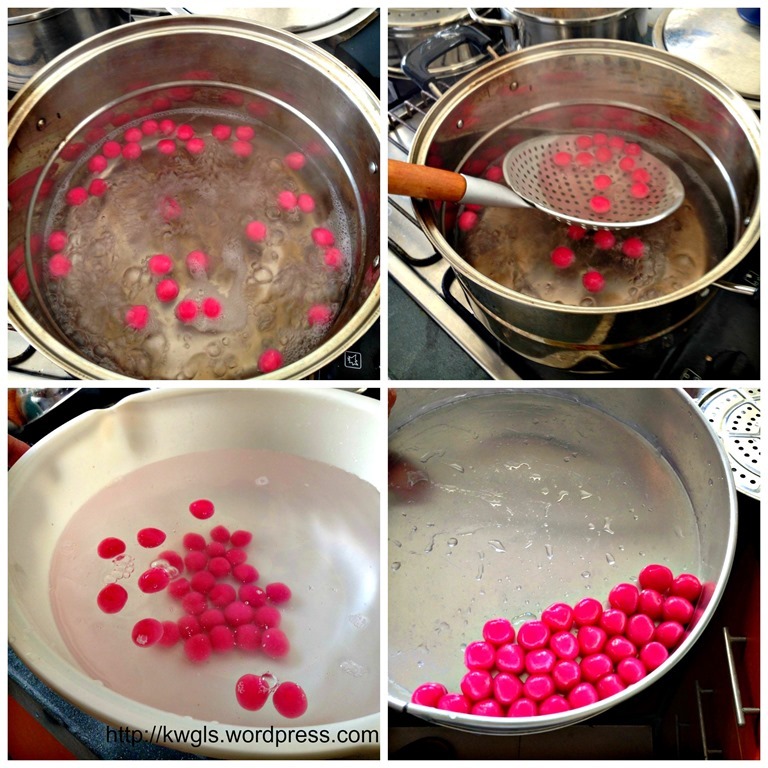 Perform the same for the red Tangyuan. Bring a pot of water to boil. Add screw pine leaves, ginger and rock sugar. Once boiled, let it simmer for at least 15 minutes until the ginger and screw pine aroma permeates the kitchen. 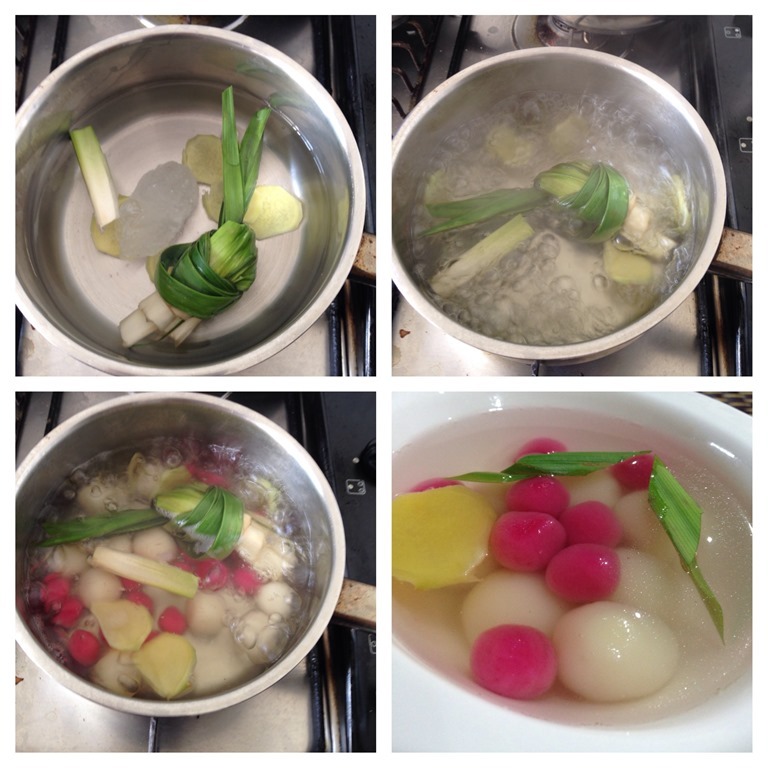 Add in some of the Tangyuan and let it boiled for 2-3 minutes. 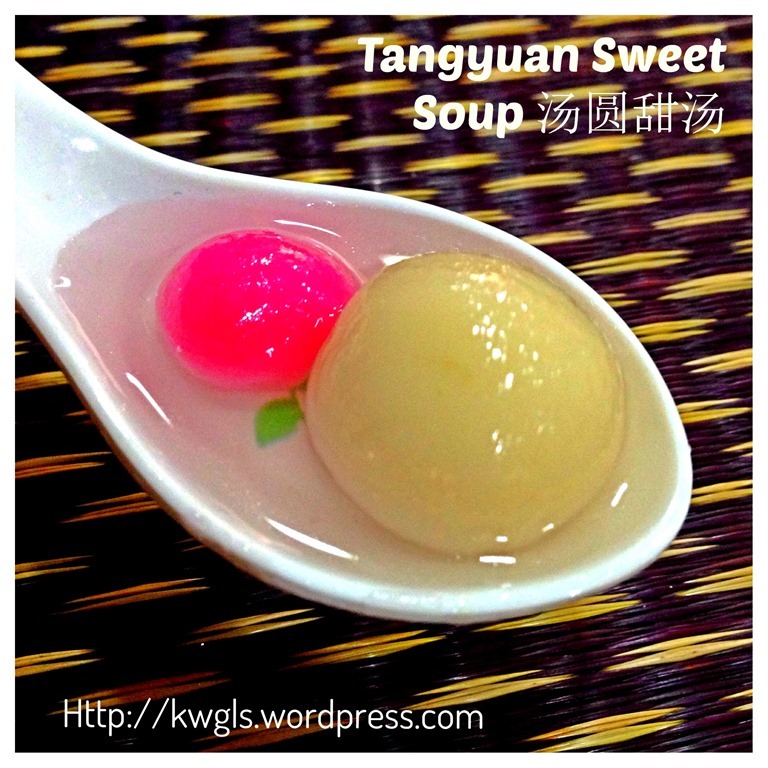 Best served hot as a snack or dessert after the meals when the Tangyuan is hot. There will no picture for this savoury Tangyuan. The preparation is exactly the same as the preparation of Napa Cabbage soup. 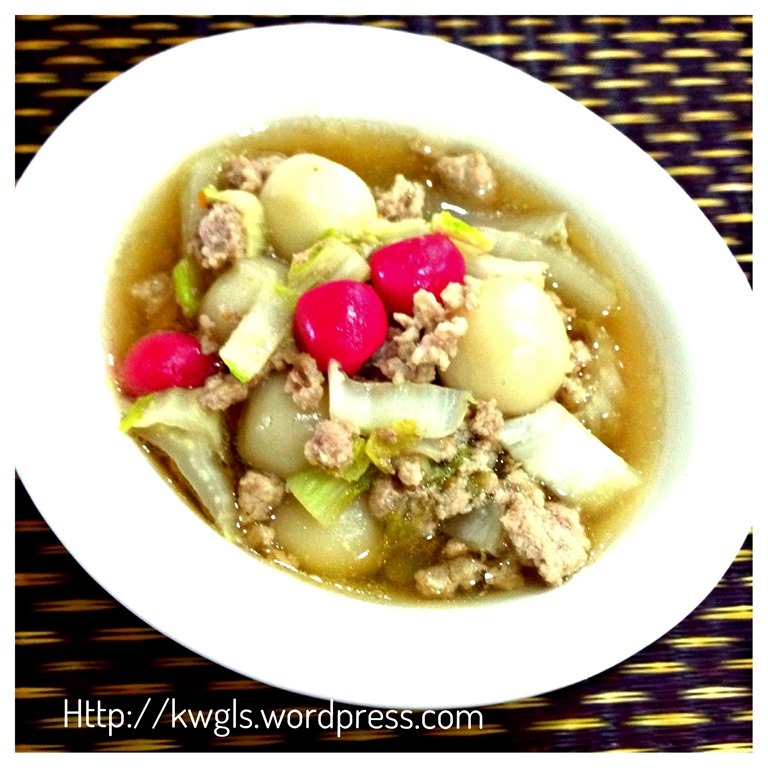 You can refer here for the recipes – Chinese Cabbage (Napa) Soup ( 大白菜汤). Put some Tangyuan in the hot boiling Chinese (Napa) Soup, boiled for 2-3 minutes and can be served as a meal replacing rice or porridges. I was rather surprise that my kids love the savoury Tangyuan than the sweet Tangyuan. 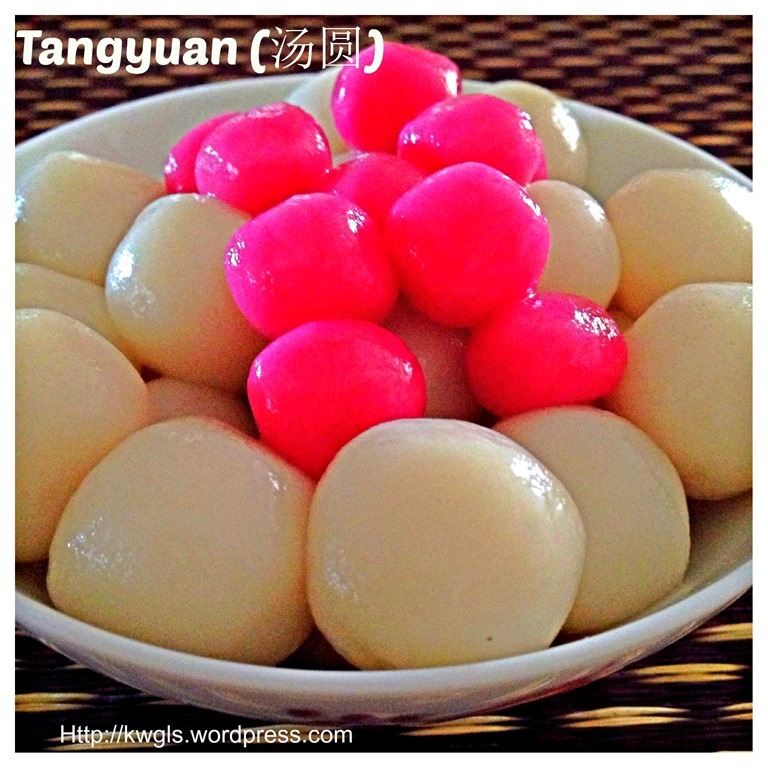 This post is a simple post and most family may know how to prepare these Tangyuan. Nothing to shout about but the intention of preparing these no filling Tangyuan in my prescribe size and colour serves as a respect to my late mum and our clan’s traditions. Hope you like the post today and have a nice day. 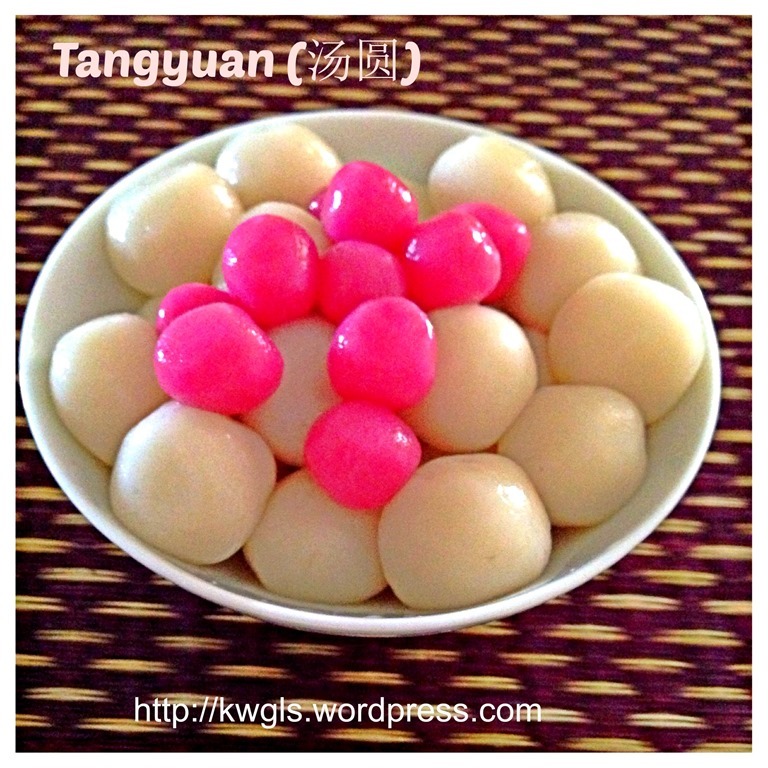 This entry was posted in Chinese and Asian Cakes and Snacks, Food Preparation Series and tagged 8, glutinous rice balls, GUAI SHU SHU, Guaishushu, kenneth goh, postaday, tangyuan, winter solstice, 汤圆，. Bookmark the permalink. 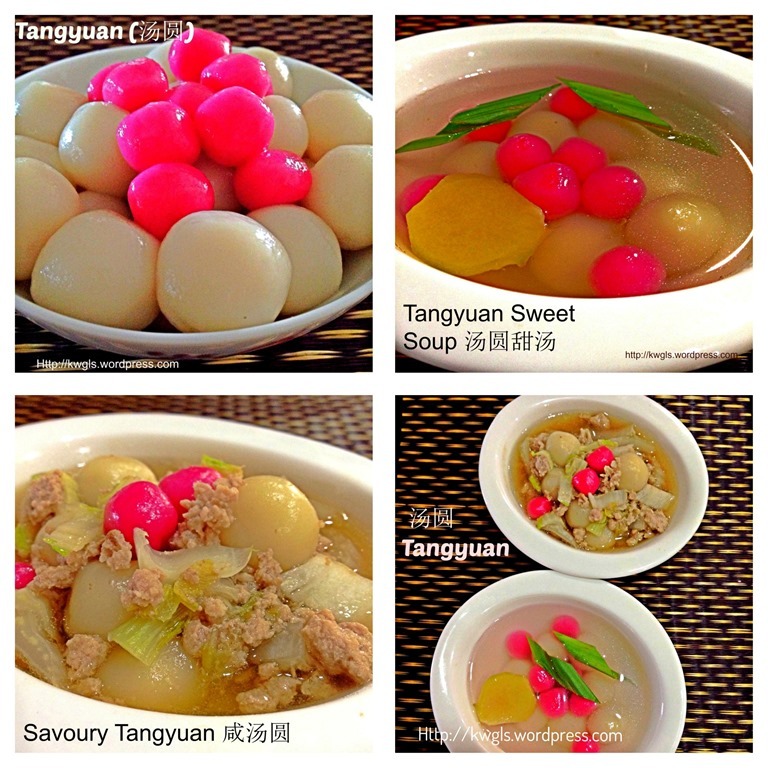 Besides my house, I have never seen the savory version of tangyuan. After I issue the post, I was shocked that quit4 a lot of people ever try the savoury version. It is definitely a traditional recipe that was forgotten by the generations nowadays. It was supposed to be a one pot dish in itself meaning if we are having this, we will not have porridge or rice. What a lovely tradition. I enjoyed reading about it. I will make sure to try them if ever I get the opportunity. This sounds so interesting. I love being introduced to so many new cuisines and recipes on your blog. I always enjoy learning about your traditions and cultural recipes. I never tire of reading your stories. The Tangyaun is very pretty – I love the red balls among the white ones. Thank you for hosting and sharing on the Four Seasons Blog Hop.